DO sport and physical exercise make you smarter? 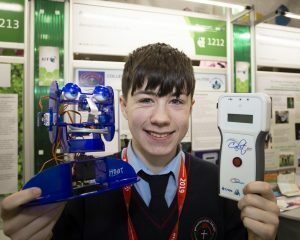 That was the question posed by two young scholars from Knockbeg College, when they scooped a prize in the prestigious BT Young Scientist exhibition last week. Oisín Chelmiah from Arles and Luke Conroy from Bagenalstown were thrilled to come second in their category, in a competition which included 550 projects. “We were really shocked – we weren’t expecting to win at all,” said Oisín. Their project, Is being physically active a clever idea? A statistical analysis of the correlation between academic success and physical activity, took them a year to complete and involved them liaising with professors in DCU. The duo also worked under the guidance of their teachers Rachel Hott and Stephen Attride. “They’re at the top of their class, they’re excellent students. They were so dedicated and hardworking. You could see the science and how much work they put into it,” said Rachel.